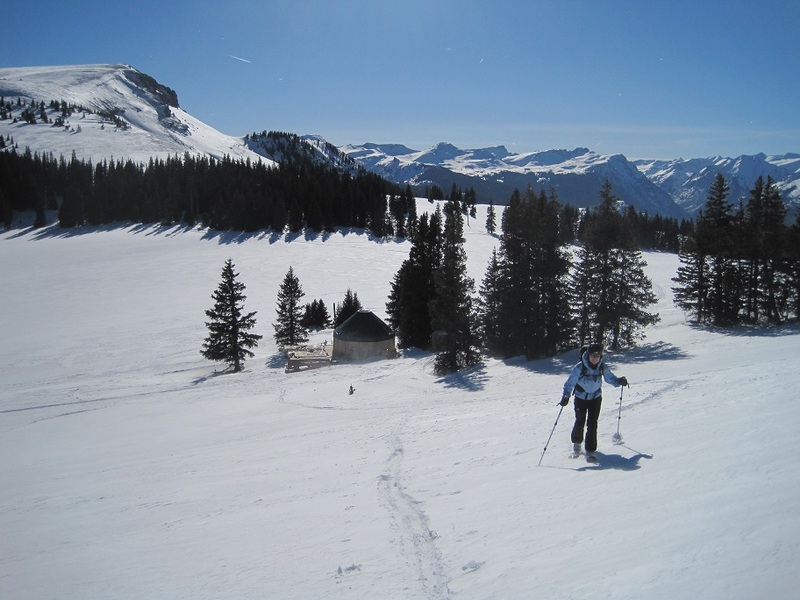 Two yurts, the Jon Wilson Yurt and the Colorado Trail Friends Yurt, are currently available on a year round basis. The old Rambouillet Yurt has been refurbished and is set up at the Jon Wilson site. The 16 foot diameter yurt which has served as the Jon Wilson Yurt for the last few years will be available to relocate to the Fawn Lakes site at some point in the future. The BLM has approved a new site for the Rambouillet Yurt. The new location will be about 0.5 mile NNW and about 300 feet higher than the current location. The new location will have excellent views of Uncompaghre and Wetterhorn Peaks and the upper Lake Fork drainage. Skiing possibilities will begin at the deck with many options down toward Sawmill Park including the Sawmill Headwall; 1,000 feet of vert on 35 degree slope (plus and or minus) open to treed skiing, starting at timberline. A new yurt is being constructed for the new Rambouillet site. Hinsdale Haute Route (dba) was incorporated in 1988 as La Garita Haute Route Association, a Colorado Non-Profit Corporation and has been developed and maintained entirely by volunteers. The original Special Use Permits with Forest Service and BLM required that the yurts be set up each year, only after enough snow had fallen to haul the yurts and the furnishings in on the snow, and to remove it all each spring before the snow melted. A prototype yurt was manufactured in 1991 and set up near the current Colorado Trail Friends Yurt site for Forest Service personnel to see. The Jon Wilson Memorial Yurt was constructed with donated memorial funds for materials and volunteer labor; it was initially set up in Cebolla Creek in 1992. The Rambouillet Yurt was constructed with donated funds and volunteer labor; it was initially set up in Rambouillet Park in 1993. The Colorado Trail Friends Yurt was constructed through Colorado Trail Foundation related memorial and friends donations and volunteer labor; it was set up in 1994. The Colorado Trail Friends Yurt has been serving Colorado Trail and Continental Divide Trail hikers since the summer of 2011.